Shopping centres are often maligned as undemocratic spaces, with a problematic relationship between private ownership and public participation, between private commercialization and public consumption, yet are offered here as a case study for everyday but significant urban experiences. Shopping centre interiors provide uncanny opportunities for public participation that can be seen to point to new concepts of citizenship. 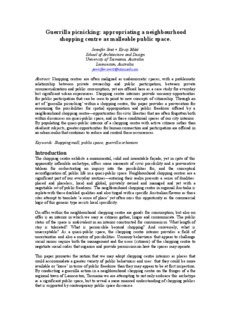 Through an act of 'guerrilla picnicking' within a shopping centre, this paper provides a provocation for examining the possibilities for spatial appropriation and public freedoms offered by a neighbourhood shopping centre - opportunities for civic liberties that are often forgotten both within discourses on quasi-public space, and in these conditional spaces of our city interiors. By populating the quasi-public interior of a shopping centre with active citizens rather than obedient subjects, greater opportunities for human connection and participation are offered in an urban realm that continues to reduce and control these occurrences.